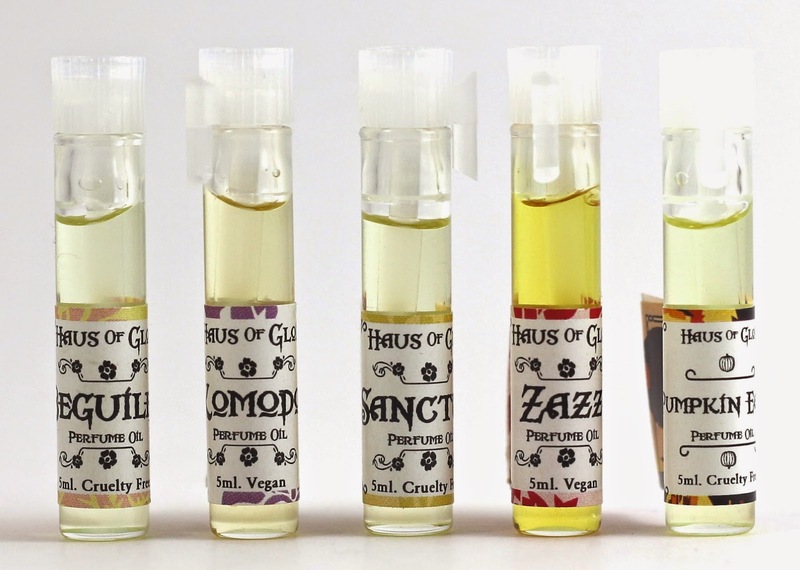 I wanted to get the Haus of Gloi Summer collection scents before they were gone on August 24th, so I grabbed the smallest sizes I could get the scents in to try, to see if there was anything I absolutely needed. I got as many scents as they had left in the perfumes, and if the perfume was sold out in a particular scent, I got the mini pumpkin butter. I also added a permanent collection scent to my order, because I had heard so many good things about it. And of course, I got my perfume sample that comes with every order, and it's a Fall scent! I'm getting so excited to try the rest of the Fall collection when that releases on the 24th. I sort of justified this purchase on my no buy because it was research for a special Indie swap I'm participating in, and wanted to see if any of these scents would be crowd-pleasers for that. I won't say if it was a successful experiment or not, in case they are reading this (it's supposed to be a surprise what we're getting), but I will say that I personally liked all the Summer scents. I think if you choose the cheapest shipping option it's always sent USPS 2-day Priority, so this did indeed arrive in 2 days, from Oregon to California. Beguiled Perfume - "Lemon cake made with the tang of fresh buttermilk and raspberry coulis - an otherwise innocent cake corrupted by cardamom and deceptive pink peppercorns." To me, this mostly smells like lemon cake, and then after a minute or so you can pick out the raspberry. I've always liked the combination of lemons and raspberries, so I think this one smells really good. Komodo Perfume - "Mangosteen, Tahitian vanilla bean, dragons blood resin and faded tropical blooms." This is a very complex fruity scent, it's warm and fruity, without being cloyingly sweet, and I think the dragon's blood gives it some depth. I could easily see this being a scent you could wear year-round, as it's not immediately fruity as you wear it. And the vanilla doesn't make it smell like a vanilla scent either. Sanctum Perfume - "A welcome respite: Muskmelon, coconut water infused with bergamot flower, kaffir lime, polished ho wood and sticky benzoin." To me this smells like honeydew, but a muskmelon is also known as cantaloupe. I can't really pick out the other notes until it's on the skin, and it smells very nice, but you definitely have to like melon. Zazz Perfume - "When something feels a bit lackluster, dull and boring, it obviously is lacking, zazz. To fix this we recommend something definitely zazzy and not overly complicated: Tart cranberry, pink grapefruit, sparkling champagne all shook up with crushed ginger root." This smells like if you made a cranberry, grapefruit champagne cocktail. It even smells bubbly, which I've smelled before, but how they get a scent to smell bubbly is beyond me. Very fun, and zazzy! Pumpkin Eater Perfume - (free sample) "Cream, glowing pumpkin, rich vanilla bean and the tiniest touch of nutmeg butter." This scent isn't currently on the site, but it will be soon as I imagine this will be released with the Fall collection. 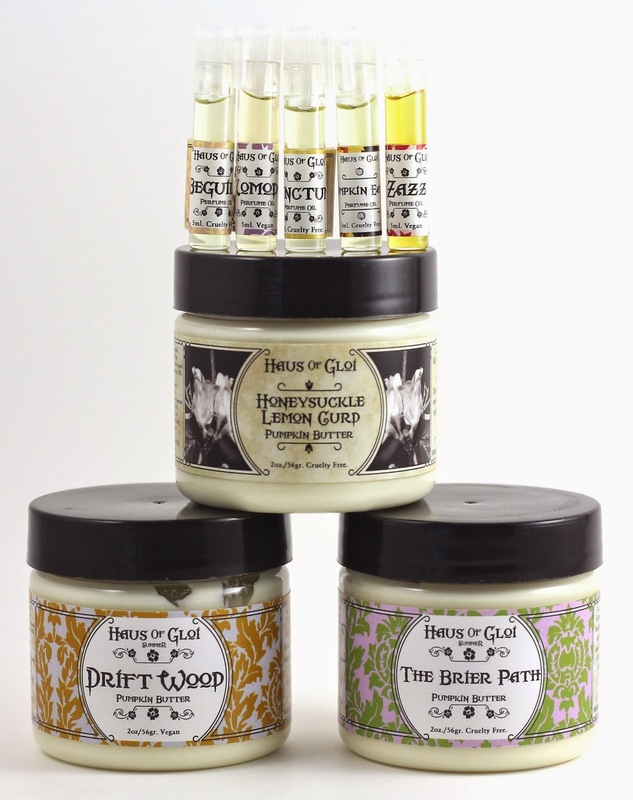 Haus of Gloi does something interesting with their seasonal collections, in that some scents are the same year after year, some go away and then come back in later years, and some are only limited to one year and never get brought back. This one must be getting brought back from past years, and I can see why. It smells like pumpkin, spices and cream. I don't like pumpkin in my food, but I do like the scent of it. And this is a very subtle pumpkin scent, and it smells lovely on the skin. A food scent, without being to heavy on the vanilla or cream or pumpkin. Just very balanced. I think it's the nutmeg butter note that makes this less "food-like" on the skin. It starts to smell almost spicy. It makes me really excited for the rest of the Fall collection, I can't wait to see which scents they go with this year. Honeysuckle Lemon Curd Pumpkin Butter - "Rich and lemony with a touch of fresh honeysuckle." This is a fresh lemony scent, without smelling like cleaning products. The honeysuckle really gives it that "something else" that you try to pinpoint, just in the background. Driftwood Pumpkin Butter - "Sun bleached driftwood, dry black musk, warm sand, dune grasses and a damp oceanic breeze." I have no idea what some of the scent notes of this one should smell like, but it's a subtle driftwood beach smell. And it smells lovely on my skin as well, so I like it! The Brier Path Pumpkin Butter - "Sun drenched trail leading to a day dream of ripe berries and woods rose, rich forest loam, ozone, dark amber and cream." You can immediately smell the berries, and then the woodsy scent. I also like this one, I feel like I should be hiking through the forest while wearing this one. Overall, I really like the Summer collection, and the Honeysuckle Lemon Curd which is a permanent collection scent. I may even like this collection more than the first set of scents I bought. I'm hooked, Haus of Gloi, you've got me! I can't wait for the Fall collection to go live on August 24th, and I'll probably have to revisit this collection next year to get some more of my favorites in a full size.